Hi, Friends! Today I am going to open up a little bit and share with you the key pieces I would choose for my dream living room, an Industrial Farmhouse Style Living Room. My husband and I recently furnished the sitting room and we now have two more living areas to decorate. One is a large space that is currently used as a media room/music room. It holds a beautiful upright black piano, a foosball table, and a very large television. It is dusted with remnants of family game nights, random Transformers toys and my teens size 13 shoes! In other words, it needs a mini-makeover… or a demolition team. I recently discovered Shop Style Collective and was so excited browsing the web pages that I had to let you peek at what my dream living room might look like once we measure the room and come up with a plan. And although we may recycle a few pieces I absolutely love the colors in our inspiration board. I have five things that I feel are must-haves when designing a room. Inspiration – For each room, I choose a piece of artwork or something I love in an effort to inspire the room. For our bathroom remodel ( we are nearly finished) my inspiration piece was a book by Charlotte Zolotow called The Seashore Book . The artwork is beautiful and the colors are truly comparable to a trip to the beach. Remember Where I Live – I also take into consideration the style of my home and the other finished rooms in the house. We have a general color palette throughout the house that also compliments the style of our home. Our exterior is traditional with a dark gray exterior, white trim, and a smashing red door. Anchors Away – Each room needs an anchor piece and if possible it should be a piece that you are totally in love with. In a living area, this could be a sofa, a grand bookcase or a beautiful fireplace. TIP: We keep our anchor pieces neutral as well as our rugs and the coffee table. This allows color changes with accents through the seasons! Light Up My Life – call it what you like, but good lighting is a must in a busy family room or even an elegant living room. Putting overhead lights on dimmer switches, having table lamps on a pair quaint side- tables and desks, and standing lamps near occasional chairs really amp up the beauty of a room. Shelving – I need to see my heartfelt collections and photographs. I mean if you are going to the trouble of collecting books, artwork and other delightful baubles you really must include places to display them in an artful way (please no overcrowding) throughout your home. With these five things in mind, I chose what I feel would really jazz up the largest space in our house and it also incorporates my neutral anchors and my favorite a pop of red. I learned the red trick from my mom who has worked in the industry for more years than I can remember. Red is a color that is used to draw the eye. It has the most color bang for your buck when choosing eye-catching pieces for your shelves and walls. It can be as small as a ceramic bowl or as large as a wall in a house. Either way, it is a simple WOW factor that I love. However, I feel that the Industrial Farmhouse Style Living Room leaves much freedom to use several pops of red! My favorite piece of this collection is the Pyrex Entertainment Center with Piers by the Laurel Foundry Modern Farmhouse. You can find simpler versions that take up less space. I love the Selena 60″ TV Stand. Here are all my favorite Industrial Farmhouse Picks! Photos are linked to their online stores! Woot! I enjoyed web-shopping for a new look for our Living Room! I love the idea of mixing Industrial elements with the coziness the super popular farmhouse style. What do you think? 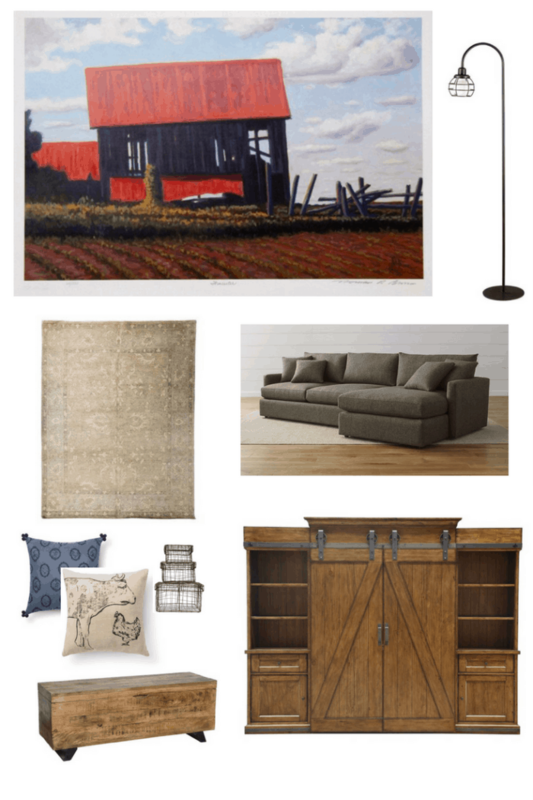 Overall our Industrial Farmhouse Style Living Room idea board is going to be so helpful in making purchasing and design choices! What would your DREAM LIVING ROOM look like??? You selected some nice choices. I am glad to hear that red is a good color to incorporate into a room. It is my favorite color. I have pops of red in my house. Not much but enough to make me happy. Thank you, Debra and my mom would probably say just one in a room. But then I would reply… but what about Christmas!???? 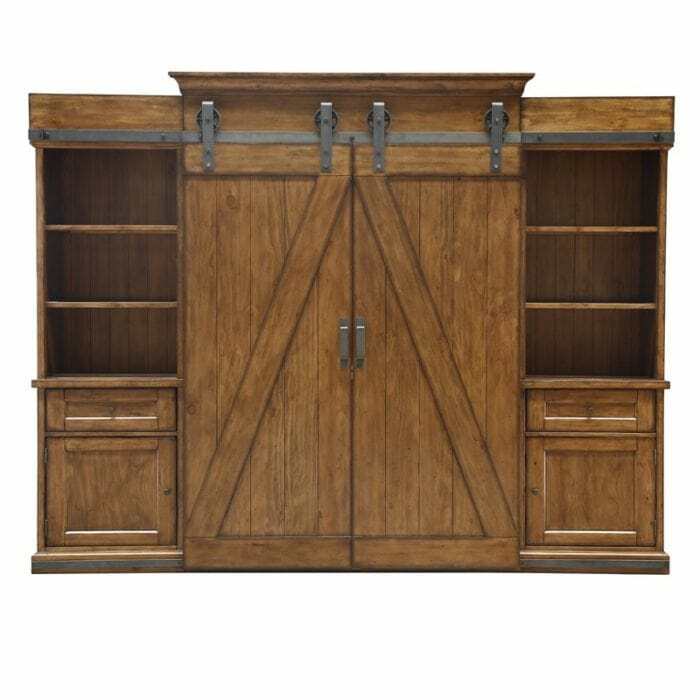 That entertainment center is spectacular. What a showpiece it is. I love that it has doors to hide what will likely be the TV.